Spread from 10: to 23:20' Kanya. Deity Surya, Lord Budha, symbol - closed hand. 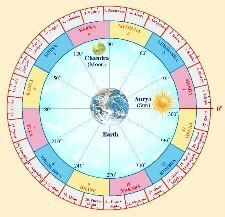 The 12 names of the sun are: (1) Arun, (2) Aditya, (3) Tapan, (4) Divakar, (5) Bhaskar, (6) Bhanu, (7) Martanda, (8) Mihir, (9) Ravi, (10) Bivakar, (11) Sahasramsu and (12) Surya. All the attributes of these names etymologically connotes are caused by this star. From the Surya we derive creativity and creation, and from creation we derive light, lustre, and strength. Surya is the prime cause of dominion, kingship, power of immunity and the light that dispels darkness. Budha is the cause of knowledge. If placed in this star he sheds light all around. The native will have a calm nature. He has a peculiar smile i.e. his cute smile has the magnetic power to attract others. This inherent quality produces a vibration on others and it becomes difficult to leave the native once such acquaintance takes place. He can easily get respect and honor from the public. He is always ready to help the needy with an unselfish motive. He does not like to deceive others even if it costs him his life. In spite of this good quality, the reward he gets in return is nothing but criticism and opposition. He does not believe in posh living. im a woman, must say, prettiest part of my face are my eyes, i do have a peculiar smile, well formed ears- haa didnt think that was a point of interest- and strong shoulders and do have a very tiny body. So thats weird. Parents are well off... ooh and i am quite outspoken, when in comfortable surroundings. I am pretty shy too. hmm strange. Thank you for the information!!!!!!!!!!!!!!! !